With the multifamily market easing up from its torrid pace of recent years, it’s becoming increasingly important to carefully think through new projects. Red Propeller Partner Stephen Fina shared some insights into smart multifamily development during an executive roundtable at Bisnow’s annual Pacific Northwest multifamily conference last month, and we wanted to take this opportunity to recount and follow up on these ideas. As leasing has slowed, many buildings have turned to prominently advertising concessions. We feel this is a bit of a panicky response to the fact that buildings no longer lease up with little or no effort, and also sends the wrong message to prospective tenants – that they should “spreadsheet shop” for the best deal. In markets like Seattle, demand is still there, particularly for thoughtful, high-quality buildings in desirable neighborhoods. The “cooling” market just means we have to put more work into developing and selling the story of each building. Red Propeller recently helped do just that for The Danforth, which has achieved nearly 50% lease-up in three months without advertising concessions. It seems like each new building over the past few years has ratcheted up the bar when it comes to the number, size and grandeur of amenities. That’s clearly unsustainable, and also unnecessary. Each building should have a distinctive target audience, which will place high priority on certain amenities and little value on others. It is crucial, therefore, to know your audience and what they truly want from their living experience. That’s not easy, which is probably why we’re still in business! We help define each buildings audience and tailor amenities to that audience so our clients know what to deliver. 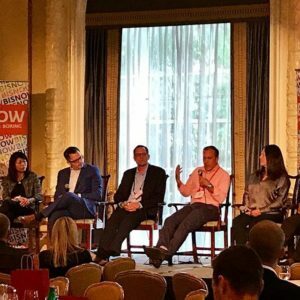 At Bisnow, Stephen was asked where he’d invest $1 million in Seattle right now. His answer: Columbia City and other parts of the Rainier Valley. While places like South Lake Union, Denny Triangle and Capitol Hill draw much more attention, the Rainier Valley offers light-rail access, lower land costs and a diverse, authentic character that appeals to many people. It also has an existing resident base that can be nervous about the changes that often accompany new multifamily development. We’ve worked with developers on several recent projects in the Rainier Valley, leveraging our knowledge of the area to help them become valued, authentic additions that acknowledge and contribute to the character of their neighborhoods. We specialize in getting to know the story of neighborhoods throughout the Seattle area and across North America, and then applying this knowledge to our clients’ projects. Project websites should show all available units, with pricing, so buyers don’t have to trudge down to a sales center to see what’s available. We recommend giving Goyer’s full post a read.